Never used Dropbox. I use OneDrive sometimes, in both Linux and Windows, never for important files. I connect through a web browser in Linux. What is the fix, and how to do that unofficially in compiz? So you’d have to either fix that? or disable the xorg-gtest tests (-DBUILD_XORG_GTEST=OFF) or build as root. One of the former 2 is better than last option. After reading some older blog posts, I found that you can use the mini.iso on an uefi system. All you have to do is extract the mini iso to a folder and chown it, then open the /boot/grub folder and mount the efi.img with archive mounter and then copy the resulting efi folder to that extracted folder. Then copy the contents of that folder with the extracted mini.iso and the efi folder to a fat32 usb stick. Then you can boot it normally in an uefi laptop. When you extract the mini.iso, you won’t see the efi folder. You mount the efi.img to get at it. Then paste it. Then boot the mini iso in an uefi laptop/desktop, then install it and do as @manbutu had shown to get a pure ubuntu-unity-desktop. I suppose, you can download dropbox integration packages from here. It’s just a matter of installing the nemo-dropbox-extension & having dropbox installed. The Cinnamon Stable PPA has various versions of the extension. One likely doesn’t need to add the ppa nor particularly match nemo & extension versions, just dl the package & install via apt. If you want to submit a patch you can send them on the mailing list (you need to subscribe first), or you can open pull request on launchpad (unity now moved to git) . For bzr based repos you can open merge request at launchpad. Is it possible to not to place Nautilus, Gedit, Firefox as dependencies in ubuntu-unity-desktop and/or in unity or unity-session? This is the depends part, right? only nautilus-data is installed as dependency. Same with installing unity with --no-install-recommends. No idea why nautilus-data is needed anyway for unity to work. I am trying this on the install I have now with ubuntu-session without Nautilus. Unity-settings-daemon pulls nautilus-data which install gschema. Without it u-s-d will crash and you won’t be able to login. Beside nautilus is burried deep in unity ( launcher progress bar, launcher-trash, quicklists, unity-lens-files, zeitgeist integration, hud, bamf, indicator-appmenu, etc…it’s everywhere). You can’t have productive desktop without it. Unity may crash or spams syslog heavily. 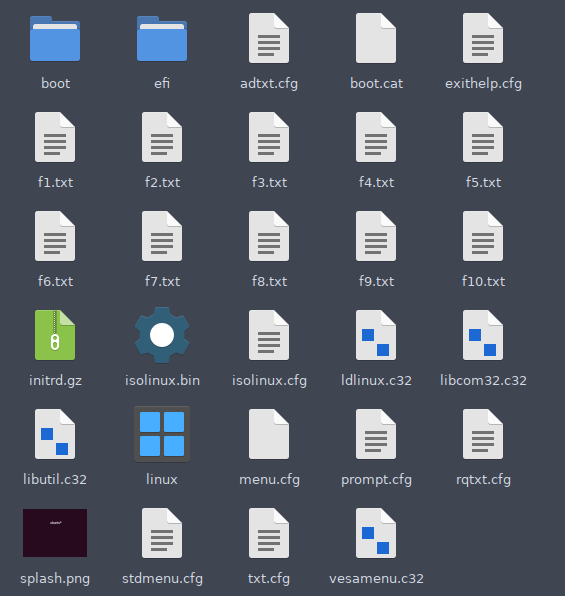 However you can have a different filemanager with parts of nautilus installed. Maybe, just nautilus-data is buried deep in unity, not nautilus itself. In the other (ubuntu default) install, both nautilus and nautilus data are uninstalled, and it is working. Here in unity, I can get nautilus out, but not nautilus data. Doesn’t matter, really. Btw, once back in Unity, don’t feel like going back to that install at all. Except to the Openbox one. There’s also something Unity settings has that Gnome settings doesn’t, locking the laptop, when the lid is closed. But, both doesn’t have adjustment of low battery level for notification. @khurshid-alam is there a possibility to add that adjustment to the Unity settings? I do it manually by changing the /etc/Upower/Upower.conf > PercentageLow=10 to 18. If this parameter change can be linked to the settings, it would be nice. Btw, is there notifications in Unity Settings? is there a possibility to add that adjustment to the Unity settings? I do it manually by changing the /etc/Upower/Upower.conf > PercentageLow=10 to 18. If this parameter change can be linked to the settings, it would be nice. Upower.conf change didn’t work with Unity, but worked with Gnome-shell and Budgie. I changed the current value in percentage-low in (org.gnome.settings-daemon.plugins.power) from 10 to 18, but have to wait until next battery drop. In percentage-critical, the values is 3, what does that mean? (What a mess Gnome is doing, really? Don’t they know that people use laptops, even in offices, not desktops these days? Committing suicide, most probably.) I put that in brackets, for it is just ranting. 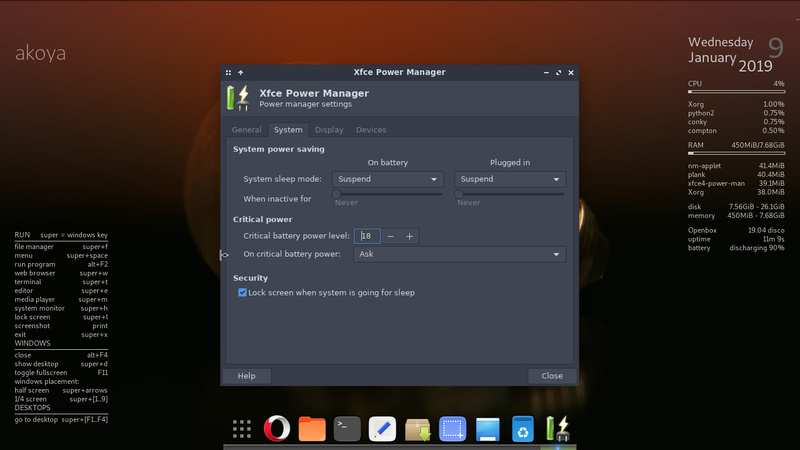 In Openbox, I am using xfce4-power-manager and I don’t have any problems with locking on closed lid or notifications of low battery and changing the critical battery level. Do you think, can we just drop gnome power manager and use xfce4 one instead in Unity? Didn’t work with changing the default value to false, either. Didn’t work with the default value too. Setting it to suspend didn’t work too.